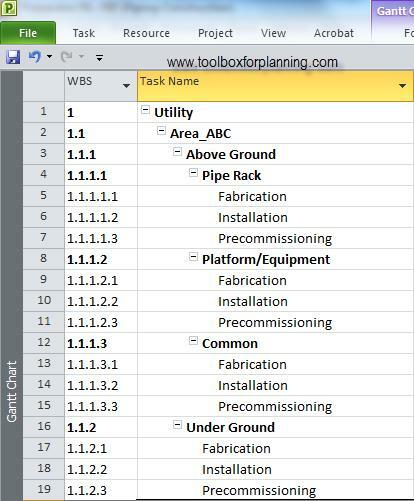 Sample WBS for piping construction project for a refinery or chemical plant may be organized as the following. It is worth to be organized by location wise (i.e. platform and pipe rack, platform and equipment around piping) prior to “Phase” WBS. Timely completion of piping construction is not only depending on timely receiving of engineering drawings and materials from Owner/EPC Contractor but timely availability of the infrastructure should also be addressed. Sometime it refers to work front availability. Developing WBS is mainly depending on the project scope. It should be defined according to the project specific as every project is different, for instance, “Demolishing” WBS may also be added under “Phase” level priority to “Installation” WBS if your project scope involved a considerable amount of piping demolishing scope. “Above Ground” and “Under Ground” WBS can be left in case no underground piping work is included in the project. (1) Level 1: Plant Unit, e.g. Utility Unit, Ethylene Theater Unit, etc. (2) Level 2: Area within a Unit, for instance, Area ABC, Area XYZ. Area demarcation is marked for a group of process piping on above ground and underground. (3) Level 3: Height. This is to segregate pipe work on the above ground and underground. (4) Level 4: Location where pipeline is run, for instance, piping on and around pipe rack, equipment and equipment platform. (5) Level 5: Phase, e.g. Fabrication, Installation (field erection, NDT) and pre-commissioning (hydro testing, air flushing, chemical cleaning etc.). 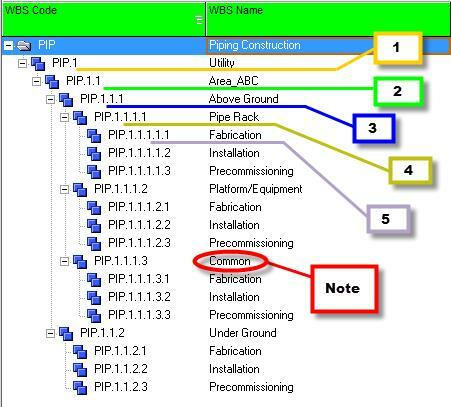 Note : “Common” WBS name refers to common location where interconnecting piping is running between the pipe rack and equipment or equipment platform. Having a clear definition of what is and what is not meant by “Common” is important. Download WBS template in Primavera P6. Download sample WBS template in MS Project 2010. 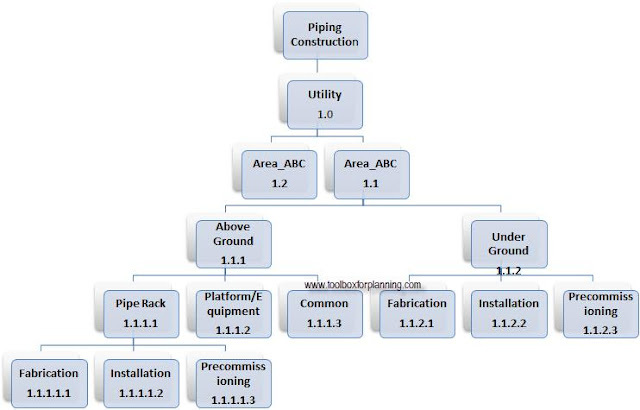 Sample WBS template Piping Construction in Hierarchical Structure is as below. For the benefit of fellow planner/scheduler and project controls engineer , all comments are welcomed. Thank you for sharing with us our ideas about this issue. I'm the newbie commenting in your previous post about this part of the project. I think that, for this specific project, it suits better to planify by "sections", meaning each part of the P&ID (for instance, demineralization plant, crystallizers, etc...). Since we have a big rack also, we should think on that. I'll come back to you later if I have any new doubts, thank you very much for your help. Thank you for your valuable comment. I would agreed with your idea. Section you meant here could be the same as Plant Unit ( as stated on item-1). By the way, when you are planning the steel structure phase of your project, which is the best way? By GA drawings? By Units? (I mean, the Units that make up the plant? It could be planned by each GA drawing or a group of GA drawings depending on how GA drawing is organized. If each GA drawing is designed for individual platform or pipe rack within the unit, you can go by GA drawing. Otherwise, plant unit would be the best. Would you agree with this kind of WBS structure? - Erect Steel Structure @+6500 EL and so on. Thank you for sharing this issue. Could you please provide activities for each WBS?